The 6th Grade Division of the Clash For The Cup gave us a look at the up and coming talent. Here are the top performers that came to play down at Hoop Group Headquarters. Niels Lane Guard (Team IZOD)- Lane has been known as a scorer for his short time on the Spotlight circuit and this weekend was no difference. He averaged near 14 points a game with his best out puts coming against Team Final and Jersey Phoenix. This squad counts on him to get things done and he delivered. Zion Bethea Guard (Team IZOD)- The big guard added to IZOD’s scoring punch in this event. He hit up Jersey Phoenix for 20 markers and also went to work against state rival Hilltoppers Heat for 16 points. When he’s on Team IZOD excels even more. Richie Greaves Guard (Team IZOD)- With all these weapons around him Greaves’s job is to run the show and dish the rock. This point guard does his job well while being equipped with a slick handle and uncanny court vision. But if you make the mistake of leaving him open he will bury the trey. Shane Dezonie Guard (Team IZOD)- Dezonie had a solid tournament. He gives IZOD another strong ball handler and capable scorer. He averaged about 8 points a contest while playing his role. Darius Johnson Guard (Team Takeover)- Johnson is a dynamic guard from the PV area. Right now he’s in combo mode and can fill up the scoring column quickly. He went berserk against New Heights while dropping a game high 25 points. He was one of the best scorer’s in the building on this level. Malcolm Dread Guard (Team Takeover)- The younger Dread played well alongside Johnson. In their big game against CT Select Dread cashed in with 17 markers. He’s definitely a player that we will be keeping our eye on. Hunter Dinkinson Forward (Team Takeover)- TT’s big man has a feathery touch and was a joy to watch this weekend. Size runs in his family therefore don’t be surprised he reaches 6’8. Takeover has a nice prospect in this kid. Luke Hill Guard (Team Takeover)- Hill has the ability to get to the charity stripe. He showed that in their contest versus New Heights while dropping 15 points. In that game he was 6-7 from the foul line. Cari Douglas Guard (CT Select)- Douglas caught fire in their marathon against ESYC. He drained 4 treys on his way to 20 points. He represented the New England area to the fullest. Malik Proctor Guard (CT Select)- Proctor also got into the action against ESYC. He nailed two trey and made a living at the free throw line. I like the Douglas and Proctor combination for the CT Select future. Nick Filchner Guard (EYSC Elite)- This high scoring guard can flat out shoot the ball. He possesses a quick release and understands how to get open on the floor. He has his best outing against CT Select while knocking down 5 treys and finishing with 25 points. 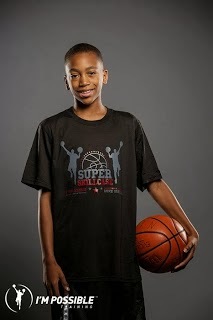 Julian Thomas Guard (EYSC Elite)- Thomas is Mr. Everything for the Pennsylvania team. He was his team’s best ball handler, scorer and rebounder. He’s a good asset for this squad. Luke Kolaja Forward (Hilltoppers Heat)- The man in the middle for the Heat already understands the concept of paint and help defense. He’s still a little raw on offense but once he gets better footwork and body control he could be a good prospect. Jalen Hammond Guard (Hilltoppers Heat)- Hammond does the job on the perimeter for the Heat. He’s a sharp shooter with good range and form. He was the Heat's best player during the Clash For The Cup. Basketball Spotlight Headed South In March! AC Showcase Getting Early Interest! The DMV Takeover Almost At Capacity! The Sheraton To Host The Atlantic City Showcase! Spotlight Alum Lowe Makes School History! Harmon Gearing Up For DMV Takeover! DMV Takeover Picking Up Steam! Basketball Spotlight Clash For The Cup Was Fire!